This Chandra image reveals a point-like source of X-rays embedded in the remains of the supernova remnant IC443. This discovery was made by three high school students using data from NASA's Chandra X-ray Observatory in conjunction with radio data from the National Science Foundation's Very Large Array (VLA). 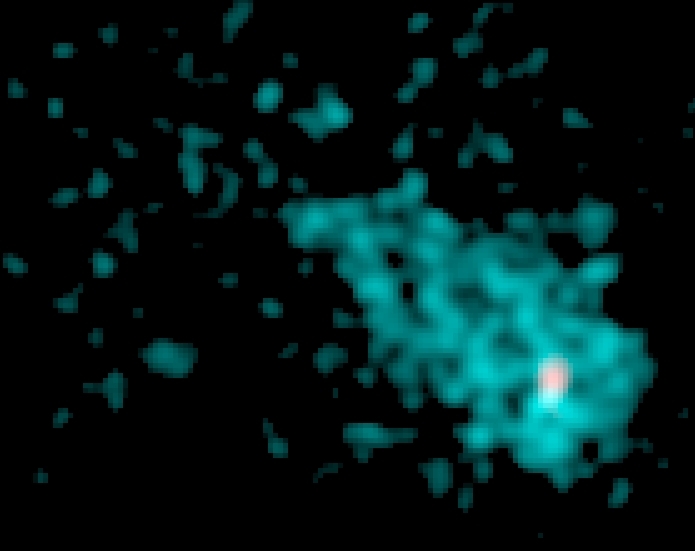 The comet-shaped appearance of the cloud of high-energy particles in the Chandra image indicates that the neutron star is moving through IC 443. Like the wake of a supersonic airplane, the swept-back shape of the nebula around the neutron star allowed the students to measure the speed it is traveling away from its origin. Using this result and the apparent distance that the neutron star has traveled from the center of the supernova remnant, the students calculated that the light from the initial explosion arrived at Earth about 30,000 years ago, thus addressing an outstanding question about IC 443. The remnant of the IC 443 supernova is a well-studied object. Astronomers have searched this region (roughly 5,000 light years from Earth) for the neutron star created in the explosion that they thought should be there, judging from the size and dynamics of the supernova remnant. The colors in this image represent the intensities of X-rays Chandra observed. Regions the most X-rays are shown in white, with the fainter regions represented by the blue-green color. Scale Image is 1 x 0.8 arcmin across.